Federal regulation is applicable in the same way in all 50 states. Each state’s economy, however, includes a unique mix of industries, so federal policies that target specific sectors of the economy will affect states in different ways. Federal regulations can, by design, target some industries more than others. For example, the Dodd-Frank Wall Street Financial Reform Act of 2010 directed federal regulatory agencies to create approximately 400 new regulations targeting the financial services sector.1 These new regulations will have a national effect because financial services matter in all states, but they will be felt more in New York than in South Carolina, simply because of the relative importance of the financial services industry in the former state. Using the RegData database, we can examine the relative impact of federal regulation on a particular state. RegData creates an industry regulation index by counting the number of words and phrases in the Code of Federal Regulations that indicate a specific mandated or prohibited activity and then by classifying those regulatory “restrictions” according to which industry or industries they likely target. 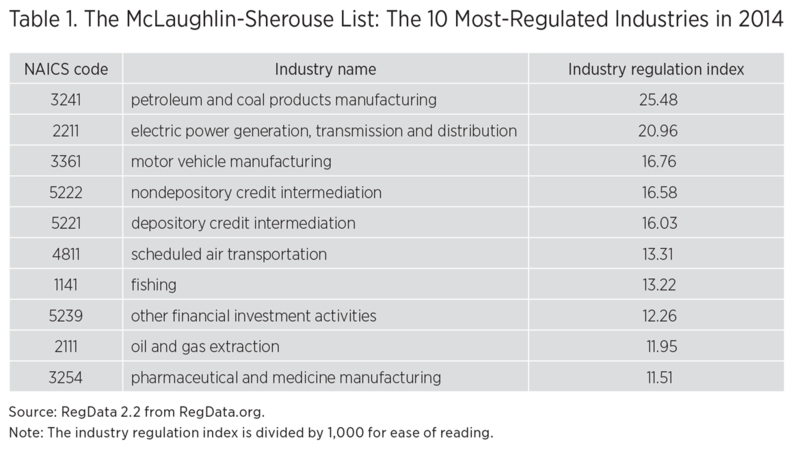 The 10 most-regulated industries in the United States for 2014 are listed in table 1. By weighting industry restrictions using the importance of an industry to a state relative to its importance to the country overall, we can produce a single Federal Regulation and State Enterprise (FRASE) index that measures the impact of federal regulation on individual states. The index is thus a ratio of the impact of federal regulations on a specific state’s industries to the impact of federal regulations on the nation’s industries in a given year. A value of 1 would indicate that a state’s private sector is affected by federal regulations to exactly the same degree as the national private sector, while a score higher than 1 would indicate a higher impact of federal regulation on a state’s private sector. For 2013, Massachusetts scored a 0.77 on the FRASE index. By design, the FRASE index for the United States overall in any year will equal 1, so a score of 0.77 indicates that the impact of federal regulation on Massachusetts’s industries was more than 20 percent lower than the impact on the nation overall. While there is some fluctuation from year to year in the ratio of the impact of federal regulation on the state to its impact on the nation, more dramatic growth occurs in the total number of such regulatory restrictions affecting the state since 1997. One way to measure this impact is to scale the weighted restrictions to the total weighted restrictions for the national economy in 1997. Doing so allows us to calculate the growth of the FRASE index relative to 1997. For Massachusetts, the FRASE index, scaled by total weighted restrictions for 1997, has grown by 39 percent from 1997 to 2013. As shown in table A1 in the appendix, this significant growth in the 1997-based FRASE score contrasts with the more modest growth in the current-year FRASE. The constant-basis index diverges from the current-basis version because it takes into account the growth in regulation nationwide over time. The constant-basis FRASE for Massachusetts grew even while the current-basis FRASE remained flat. This difference suggests that it was the overall growth in regulation, rather than dis- proportionate growth in the regulation of industries important to Massachusetts, that increased the impact of federal regulation on the state since 1997. So why is the impact of federal regulation lower for Massachusetts than for the country overall? The answer lies in the particular industries that make up the state’s economy and how regulated those industries are. The top five industries by contribution to the state’s private sector are shown in figure 1, and the contributions of those industries to the state and national private sector are compared in figure 2. 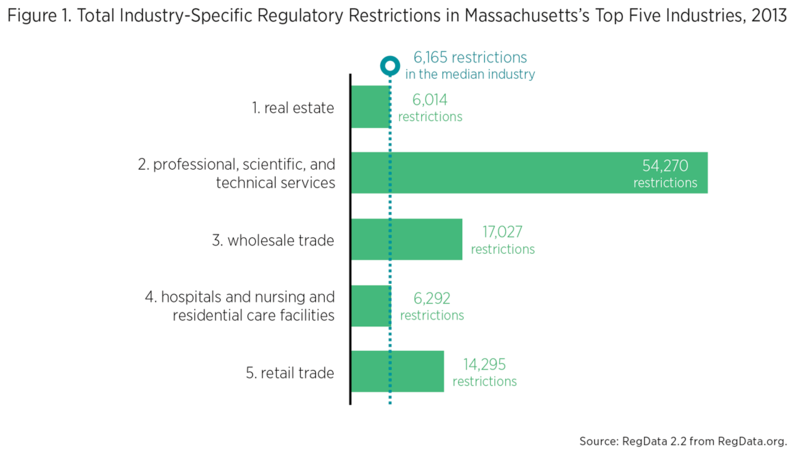 Two of Massachusetts’s top five industries, real estate and hospitals (which includes nursing and residential care facilities), are regulated at about the median for all industries. 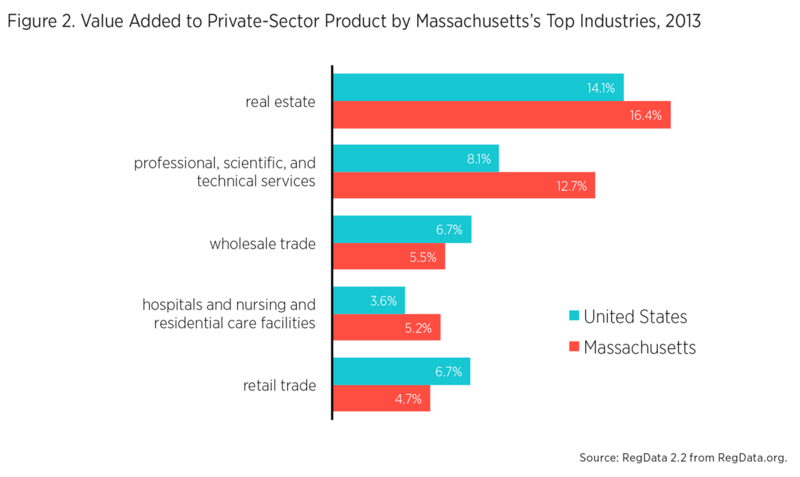 Two more—whole- sale trade and retail trade—are more highly regulated, but matter less to Massachusetts’s private sector than to the nation’s as a whole. Both these factors keep the impact of federal regulation low on Massachusetts compared to the impact on the entire United States. In terms of regulatory restrictions, the one stand-out industry for Massachusetts is professional, scientific, and technical services. This industry is subject to a large number of restrictions—more than 50,000—but it is also one of the most broadly defined in the industry classification system. It includes legal services, accounting, tax preparation services, architecture, engineering, geophysical surveying—even interior and graphic design. The expansiveness of this industry explains the high number of restrictions, but it also makes precise measurement of the impact of federal regulations more difficult for Massachusetts than for other states that feature other industries. So who is doing the regulating of this broad industry? 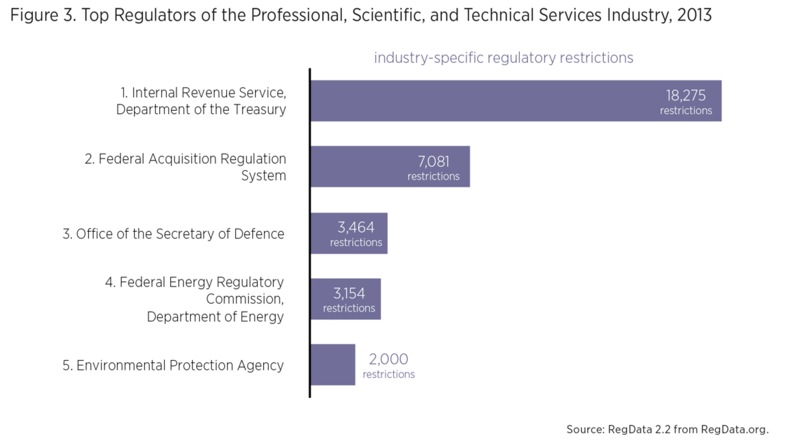 The top five regulators of the professional, scientific, and technical services industry are shown in figure 3. The top regulator, relevant to all subcategories within the industry but particularly to lawyers, accountants, and tax preparers, is the Internal Revenue Service. Responsible for more than 18,000 industry-specific restrictions, the IRS accounts for about one-third of the industry total. Other regulations come from the Federal Acquisition Regulations, the Office of the Secretary of Defense, the Federal Energy Regulatory Commission, and the Environmental Protection Agency.